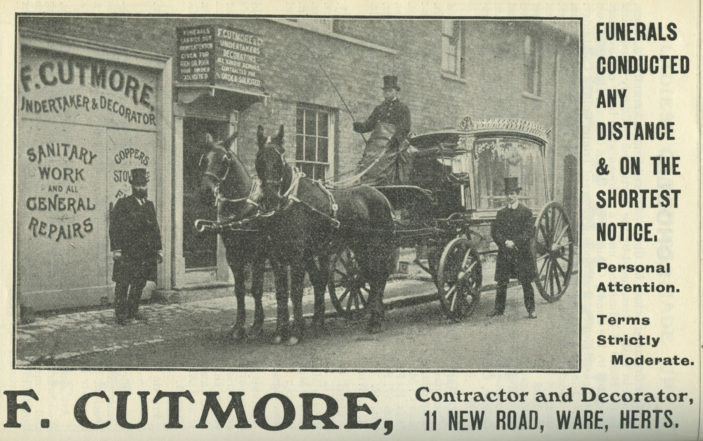 Frederick Cutmore ran his business at 11 New Road Ware from about 1910 to the early 1930s. This image from a directory shows them standing proudly outside in 1920. Frederick was born in Thundridge in 1862 and became a bricklayer. He married Louisa Tillcock in 1881 and lived in Milton Road. On the 1911 census he was with Louisa, their son George, a painter and decorator and a lodger, Violet Mabel Walters, a shop assistant from Cornwall. Louisa died in 1925 and Frederick in 1936. The next occupant of number 11 was Sam Bell.